Stabilizing, balancing and nurturing. Geranium Bourbon Essential Oil is obtained from a specific pelargonium hybrid grown and distilled only in La Réunion, previously known as Île Bourbon (Bourbon Island). The fragrance of this particular geranium essential oil is considered by most experts to be superior to most other varieties. This remarkable oil is balancing to both body and mind, helping to normalize dry and oily skin types and stabilizing all manner roller coaster emotions. 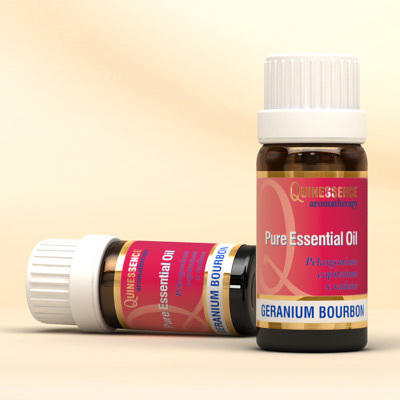 Geranium Bourbon Essential Oil is also an effective adaptogen, which means it regulates and strengthens the body’s immune, glandular and nervous systems, thereby increasing resistance to stress. Therapeutically, the range of therapeutic properties are the same as the oil obtained from Pelargonium graveolens, but Geranium Bourbon Essential Oil is preferred by many aromatherapists due to its sweeter, more floral fragrance that blends delightfully with a wide range of oils.